Singer, actor, and movie producer whose career has spanned more than fifty years and resulted in seven Latin Grammy Awards. He first picked up a guitar when he was eight years old. He released his first album, entitled La Voz Que Usted Esperaba, in 1967. 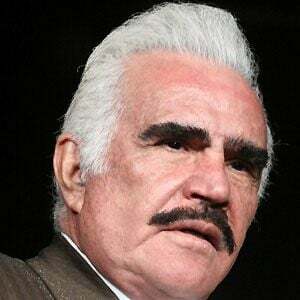 He released Los 2 Vicentes, a duet album with his son Vincente Fernandez Jr., in 2012. He married María del Refugio Abarca Villaseñor in 1963. He has four children named Alejandra, Alejandro, Gerardo, and Vicente. He is the father of successful Latin artist Alejandro Fernandez.